The map of South Dakota has over 49 place names because of one trip the US Frontier Army took through the territory. Tilford, Ludlow, Custer Peak, and Trail City in Corson County are on the map to memorialize the Army’s trip through The Great Sioux – Cheyenne reservation led by George Armstrong Custer. When the territory eventually became a state in l889 one of the first names chosen for a County seat west of the Missouri River was Custer County located in the southwest corner of the new State. The Black Hills of Dakota Territory are different than the nearby Black Hills around Laramie, Wyoming. The Northern Black Hills are a lot like an inverted bath tub on a flat prairie – 40 miles wide and 80 miles long with a geological rim running around the base of the Hills. These Black Hills are about the size of the present day state of Israel. The first time the Army actually entered the Black Hills was in 1874. Everyone at that time knew you could find gold. The only question was how much and could you get it? The War Chiefs agreed they would hunt in certain areas for a limited time, receive annual issues of sugar, coffee and cattle, and would stop harassing the railroads and settlers. The US Government agreed to remove the manned forts they had established protecting the Bozeman Trail. It’s the only treaty with Indians the government ever entered into that removed military posts from territory to be settled by the spreading population. The purpose of a thousand men and their supply wagons entering the Hills and finding a route was to record what was there. President Grant was near the end of his second term as President, and he spoke bluntly to the Indian Chiefs when they visited him in Washington D.C. that he expected them to live in peace on reservations. He would not allow free roaming Indians to check in just to receive food, clothing, and money. Grant’s policy was — if you choose to roam/live free off your reservation; your tribe will not receive annuities – or land grants – or cash payments. Sioux Chiefs such as Spotted Tail and Red Cloud resisted being counted in the census claiming it was against their religion. Grant put a stop to their tribes receiving anything until they were counted. Grant would not negotiate directly with the Chiefs; instead, they must negotiate with the Secretary of the Interior and the Church run (Quakers) head of the Indian Bureau. Grant wanted Indians treated as citizens of the United States and insisted they deal with the Government through the responsible agencies. He amended the law to make Indians citizens instead of banning them as citizens. He expected them to learn English, and make their own way in a short time by working land. Indians were issued plows, seeds, and farm equipment. The chiefs on the Northern Plains knew that Congress had designated reservations as sovereign areas and the army could not enter reservations except by permission of the tribal councils. Some insisted as heads of “Sovereign nations” they would deal only with the President – not with Indian Agents assigned by the Government – because as heads of nations they had equal rank of the President and they did not like Indian Agents telling them anything. The chiefs wanted to select their own agents to act for the Government in providing for them. Grant lost his patience with argument and ordered the Secretary of the Interior (Columbus Delano) at the time which was essentially a privately run church related welfare operation financed largely by Government manpower and money, to feed and cloth only those Indians living full time on reservations .He also ordered the army headed by General Sherman to remove tribes from non reservation land after a two year deadline to their reservation. Trail herds of cattle from Texas had for several years been grazing during wintertime in Montana territory, replacing the depleted Buffalo herd on the Plains , and cattlemen wanted Indians put on reservations , not free and able to steal horses , raid local ranchers and run off their cattle herds. In the Great Plains the Sioux and Cheyenne claimed hunting areas by treaty. They argued Grant could not take away rights approved by Congress in 1869, but never signed by two thirds of the bands affected called for by the treaty. 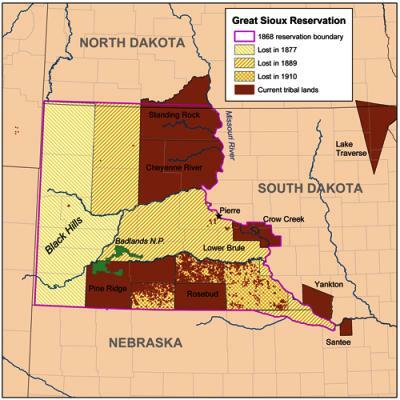 The treaty let the railroads through the Great Sioux Reservation along the Platte River. Congress let the time limited parts of the 1868 Treaty run out (food and clothing) and expected Indians to be in “Indian Territory” (present Oklahoma) – or on reservation they set up in limited states on a case by case basis. “Cattle could winter in these valleys without other food or shelter than that to be obtained from running at large.” His published report caught the attention of Gen. William B. Hazen, commander of Fort Union, at the junction of the Missouri and Yellowstone rivers, who was convinced the Great Plains was the Great American Desert. What the first journalists in the Black Hills reported stimulated thousands moving to the Hills from all directions, filling up of the country to overflowing in 1875. Thousands of jobless, underemployed and immigrant men read in the papers the word “gold” and decided to head for the Black Hills. New York City’s population at the time was near 2 million; Chicago was near 400,000, Kansas City was 350, 00, and Minneapolis was just short of 100,000. “Portions of the Black Hills are well fitted for agriculture, especially those from two to three thousand feet above the level of the sea, and all are adapted to grazing. The general elevation of the hills varies from four to seven thousand feet above the level of the sea, their base alone having an altitude of from fifteen to twenty-five hundred. From this it will be seen that they are not very high, taking their altitude from base to summit. “A military expedition to the Black Hills caused great excitement among all of the Sioux people. They regarded it as an infraction of their treaty, and were filled with the fear it might lead to their exclusion from a country they highly prized. The dispatch of Custer announcing gold in the Black Hills set off a stampede of fortune-hunters into Lakota territory. Although the 1868 Fort Laramie Treaty requires the government to protect Lakota lands from intruders, federal authorities were asked and felt they had to protect the miners traveling along the road Custer blazed for them, which they call “Freedom’s Trail” and the Lakota call “Thieves Road. The Army with less than 25,000 men on active duty in the entire Army failed to keep Gold seekers out of the Hills with several companies. So did the 25,000 Sioux who were not fighting among themselves and other bands scattered all over the Great Sioux Reservation. Both the Army and the Indian Tribes failed to keep the public out of the Hills when the public got Gold Fever. A Senate commission meeting with Red Cloud and other Lakota chiefs in 1875 to negotiate legal access for the miners rushing to the Black Hills offered to buy the region for $6 million. But the Lakota refuse to alter the terms of the 1868 Fort Laramie Treaty and declare they will protect their lands from intruders if the government will not. So Congress repealed the 1868 treaty in 1877, stopped all benefits the Indians argued they were to receive, and Congress took back 40 million acres of land. (1) The Northern Pacific Railroad was built during the years of 1872-1873 to Bismarck across the River from the site of Ft Lincoln Custer was assigned to build. During those years, the country west of the 100 Meridian (which runs through the middle of South Dakota) had an above average rainfall. This resulted in a perception the land was suitable for farming. Custer reported the abundant grass on his 1873 expedition to Montana. His reports along with the railroad’s advertisements designed to sell land and entice settlers west, painted the country as conducive to settlement. Hazen refutes these claims by reports from those who experienced the normal seasons that received little rainfall. (2) Samuel J. Barrows went with the Yellowstone Expedition of 1873 and with the Black Hills Expedition in 1874 as a reporter for New York newspapers. Barrows was elected to Congress in 1897. He promoted legislation to remove Indians from reservations, believing assimilation would lead to equality. (7) My life on the Plains by Custer, representing the major part of Custer’s life, was first published some two years before the General’s Death. It is a vivid picture of the American West, the rigors of life for the settlers, and the horrors of Indian warfare. The first edition of the book included a chapter by General W R Hazen which Hazen later privately published separately as a pamphlet entitled These Barren Lands. (8)His articles on the Plains Indians were first published in the Galaxy Magazine 1872-74, and then incorporated into his book, My Life on the Plains, or, Personal Experiences with Indians, published in 1874. (9) Robert Strahorn spent his life writing and promoting. Instrumental in settling west of the Missouri river and developing its resources. He was one of the best at selling something that existed only in dreams. He touted farmland Often land so tough it would take 3 generations to succeed.